The highest standards of repair and ethics. To be treated courteously and professionally. Your vehicle will be ready when we promise it to you. We will work closely with your insurance company. A computerized estimate before work begins and a supplemental estimate if hidden damage is found. Your vehicle to be restored to original condition. An environmentally responsible place of business. Bud's Paint & Body Shop uses water soluble paints that are more durable and environmentally friendly than traditional automotive paints. Water soluble paints have better coverage and we are able to better match vehicle paint colors to your original factory color. With less clean up time and faster drying time, we can get your car back to you that much more quickly. When we built our state of the art facility we planned for a new ground source heat pump to be more energy efficient. We also recycle all possible materials including cardboard, metal and trash. Through an arrangement with Enterprise, when you drop off your car for repair Bud's Paint and Body shop you can have a rental car ready for you at our location. All claims against another person's insurance company are eligible for a rental paid for by that person's insurance company. In some cases your own insurance company covers a rental when getting body work done. Check your policy, the cost is very small for the ease it provides. Our staff will help you with the rental paperwork, and our rental company is accepted by most insurance companies. While we do not provide towing, we work with all major towing companies in the region. If you need to have a recommendation, give us a call at 573-769-2310. METALWORK: Provided is a THREE YEAR LIMITED WARRANTY, from effective date stated herein, on all metalwork and framework, to include welding and the application of materials utilized in making collision repairs against cracking, flaking, pitting or deterioration, excluding rust repairs. PAINTING, STRIPES AND DECALS: Provided is LIFETIME LIMITED WARRANTY, from effective date stated herein, on painting-related priming and paint work against solvent blistering, peeling, hazing, and excessive loss of pigmentation, and, a THREE YEAR LIMITED WARRANTY on the application and adhesion of decorative stripes and decals. MECHANICAL REPAIRS: Provided is a THREE YEAR LIMITED WARRANTY, from effective date stated herein, on all mechanical repairs pertaining directly to original collision damage. SECTION 1-4: The shop will repair, repaint, or replace any items in section 1-4, when claim is made while the present owner stated herein owns the vehicle, unless caused by or damaged resulting from unreasonable use, maintenance, or care of the vehicle. THIS WARRANTY shall be null and void if the repair is altered, adjusted or tampered with by any person not authorized by Warranty Grantor. SPECIFICALLY EXCLUDED: A. Incidental costs, such as towing fees, car rental charges, travel expenses or assemblies and components which are not specifically covered by this LIMITED WARRANTY, nor are consequential damages such as damage to other assemblies and components resulting from a defective part or installation of such part installed or repaired during the repair. B. Rust... Surface rust, rust through, and/or damage caused by rusting of interior or exterior panels is not covered. THIS STATES ALL THE LIMITED WARRANTIES made by the Shop and contains the only promises for which it will be responsible. CUSTOMER’S OBLIGATIONS: In order to obtain the benefits of this warranty, the owner of the vehicle must do the following: A. Present the owner’s copy of this warranty document to the warrantor before requesting warranted repairs or parts; B. Have any warranted repair, adjustments or inspection made only at the premises of the warrantor during normal business hours. SPECIFICALLY EXCLUDED are incidental costs, such as towing fees, car rental charges, travel expenses or assemblies and components which are not specifically covered by this WARRANTY, nor are consequential damages such as damage to other assemblies and components resulting from a defective part or installation of such part installed or repaired during the repair included in the WARRANTY. This WARRANTY shall not be varied, supplemented, qualified or interpreted by any prior course of dealings. This WARRANTY shall be null and void if the repair is altered, adjusted or tampered with by any person not authorized by the above named shop. This warranty is not transferable. For any other questions regarding your vehicle or our services don't hesitate to give us a call at 573-769-2310. Hail damage can be quickly repaired at Bud's Paint & Body Shop. 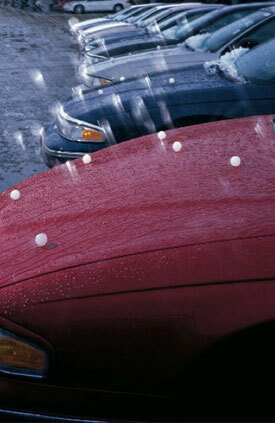 In 2008 we repaired hundreds of hail damaged vehicles. If this happens to you, call us at 573-769-2310 or just stop by for a quick estimate to get your car looking like new again. Paint-less Dent Repair or PDR is a way of removing dents from a car without using fillers or repainting. This is possible due the memory in todays automobile metals. It's this memory that gives cars their curvy lines and aerodynamics. Hail and door dings are unsightly, but with PDR we can fix them faster and get you back driving again sooner. © 2015 Bud's Paint & Body Shop, Inc.